This EasySlots game is provided on a 7x7 grid and allows players to bed anywhere from 20 pence to 150 pounds per spin, making it appealing to lots of different online gamers! The game works well on various devices which once again makes it a popular option. The games theme is based around the fantasy tale of Diwali and the festival of lights. It is a mystical theme where you can embrace Lakshimi, the goddess of wealth into this enchanting slot game with free spins and bonus features to keep engaged! The theme is steeped n rich, cultural history which provides a dramatic history lesson whilst playing. This gives it a rather unique feel that is appealing to online gamers. You tend to not hear the developers name (Iron Dog Studio) all that frequently but they exist with the reputable 1x2 Network. Their work aims to create entertaining themes and interactive gaming online to keep players entertained and help to build their online portfolio. In doing so, they aim to keep up to date with current technological advances and ensure that their games are suitable on a variety of platforms; running at a sound quality level. Their library is growing fast and demonstrating strong potential for the future so its worth keeping a close eye on the content that is available from Iron Dog Studio. Explore more features here on the Easy Slot, with many bonuses and promo's up for grabs! The main symbols include coloured light in an array of colours (purple, blue, yellow, green, orange and pink). 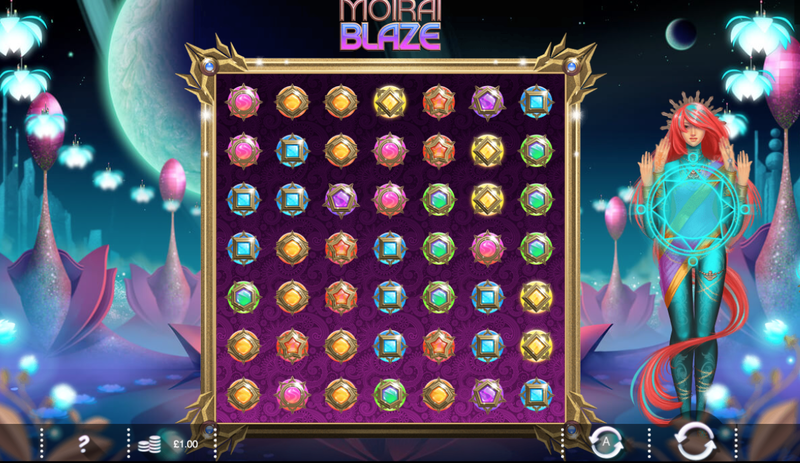 Simply collect 5 or more of one symbol that appear next to each other on the slots for a winning combination. If you manage to get between 21 and 49 of the same symbol, you will win a generous 20 times your stake! The wild symbol will substitute for any other symbol and expands over the entirety of the reel. There is an expanding wild icon that pops up too and helps to release special symbols such as the explorer symbol. This is great because will force certain symbols to tumble away – making room for winning combinations! 50 tumbles is another feature which will release a replacer symbol and change the colour of certain symbols. 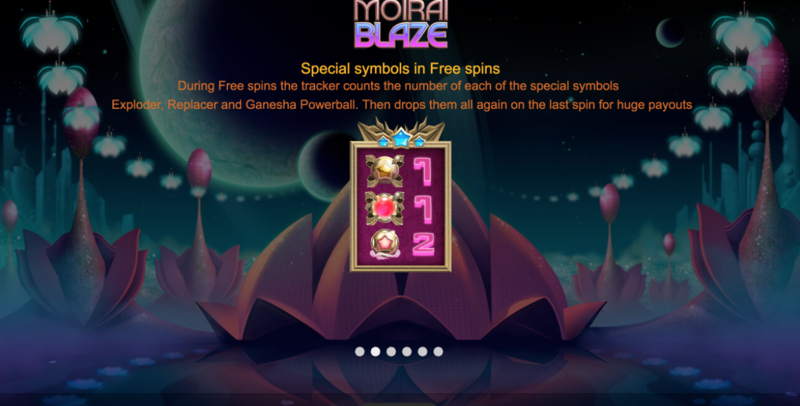 Finally, 75 tumbles will trigger the free spins feature. The free spins is a dramatic reunion of Lakshmo and Vishnu which will reward you with 15 free spins and 1x multiplier. When you land a win, the winning symbols disappear and the remaining symbols will fall into the empty spaces. New symbols will ten fall from above and give you another chance to win more cash prizes! This is a mystical and relaxing theme with a futuristic element. The soundtrack helps to keep you committed to game. This is the perfect mix of strong theming and engaging bonus rounds with the potential for big wins! 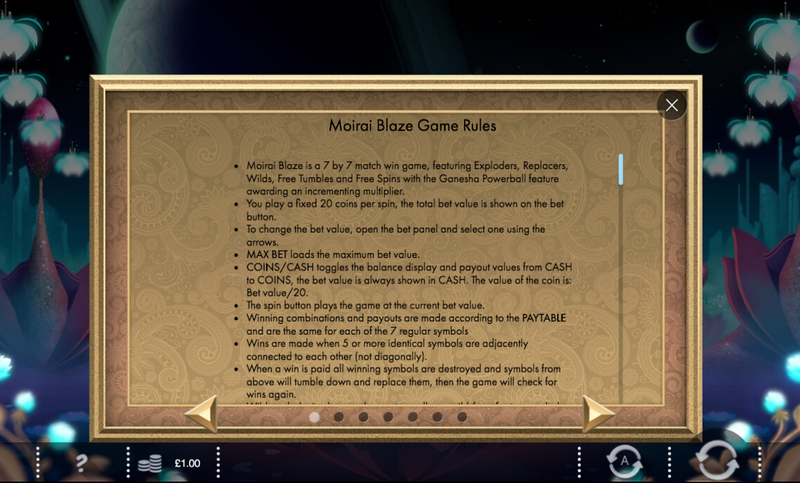 The variance is respectable as well and although there will be some higher returning slot games out there, Moirai Blaze will certainly reward you with its choice of bonus features and strong theming! So give it a go, or find out more games on Easy Slots.